Truck accident causes - how do these horrific accidents happen? There are many truck accident causes. Often, that reason is human error. Speeding, distraction, fatigue, recklessness behind the wheel and other dangerous behaviors cause thousands of deaths every year. But truckers themselves aren’t always and exclusively to blame. It’s vital to explore other potential truck accident causes, not only because we want to see justice served but also because we want to eliminate/reduce other factors that lead to crashes. Two new studies—both published in 2017—can help us understand underexplored risk factors: road conditions and the time of day. You’re statistically more likely to be in a crash at certain times of day if you live in a metropolitan area. The first study we’ll explore—Freeway crash frequency modeling under time-of-day distribution, by Yu-Chiun Chiou, Yu-Chun Sheng, and Chiang Fu—examined what distinguishes crashes that happen at different times of day. Metropolitan areas have more crashes during late afternoon—specifically during evening rush hour. Per the authors, this might occur because drivers are more fatigued and anxious to be home with their families. Alternatively, maybe there are more DUI drivers around in the evening—or maybe sightlines are worse during dusk because of urban light pollution. Rural areas, by contrast, witness more crashes late at night and during the dawn hours. Why? Per the authors, perhaps this is because rural areas have fewer streetlights. Or perhaps agricultural workers are more likely to rise (and drive) early in the morning. This second study comes from an engineering journal. The authors wanted to understand how and why truck rollovers occur. Researchers simulated different road conditions using 3D modeling—testing parameters such as road shape, traffic conditions, and steering wheel angle. Through several trials and simulations, researchers found that curved sections of freeways were most likely to lead to truck rollover. They suggested that municipalities might reduce rollovers by imposing stricter speed limits for 18-wheelers on curved sections of our highways. Engineers design a road’s shape to accommodate for natural landscaping, elevation, efficiency, and drainage of standing water from rain, snow, and ice. It’s impossible to control all factors that contribute to rollover and other accidents. However, even some risk mitigation is better than none. Perhaps stricter speed limits on curved roadways could make a difference. These studies offer food for thought for policymakers. But if you’ve been hurt in a car accident, you’re probably less interested in the policy piece and more concerned about how you can repair your car, get compensated and get your life back. 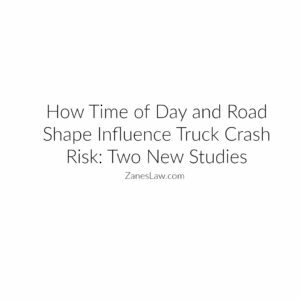 Our team at Zanes Law can help. Schedule a consultation with our Arizona truck accident attorneys at (602) 999-9999 today.